Lisa’s easy to use waterslide transfers are great for all types of clay. Use also to decorate other crafting surfaces including metal, cloth, paper, wood and glass. 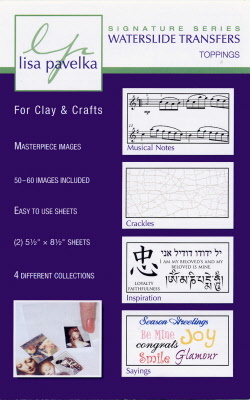 50-60 images in 4 collections - Musical notes, Crackles, Inspiration, Sayings. 2 sheets each 14cm x 21.5cm.